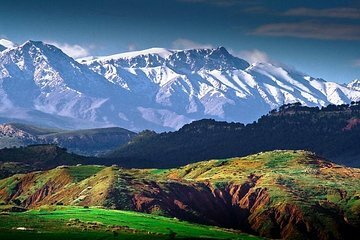 Para conhecer a cultura berbere rural, deixe a Marrakech chique e cosmopolita para trás, e se aventure pelas Altas Montanhas Atlas. Nesta excursão, viaje ao interior e ganhe insight sobre a vida local durante uma visita a uma casa berbere. Faça um passeio de camelo e uma caminhada guiada até uma cachoeira. Faça um upgrade para incluir um tradicional almoço. We were picked up at our hotel but our driver spoke very little English so we did not get any commentary about where we were going or about the mountains or the lifestyle there. The visit to the Berber house was very enjoyable because of the guy who took us around. No snacks or drinks were offered. A nice day out but disappointing in many ways. Our trip started with an amazing driver who picked us up and took us home. We visisted a Berber house and was offered tea and bread, and we also got a tour from a Berber woman who showed us how they make argan oil from scratch. We then drove up to the middle mountains and met with our tour guide who was amazing. He was very kind and welcoming, during the hike up the mountains he spoke to us about the Berber history, how they make a living, etc. As you go up the towards the waterfall there are little shops. The trip overall was beautiful and I'm very happy we booked this. Excellent experience very professional from start to finish. Collected promptly from the hotel by Abdul, who drove us towards the Atlas Mountains Ourika Valley and was more than happy to stop throughout the journey for us to take photos. The vehicle was a very comfortable 4WD with WiFi! The visit to the Berber museum and Argon Oil factory were enjoyable, although climbing up the Ourika Valley to visit the beautiful waterfalls with Mohamed was the highlight of our trip. Very beautiful and very enjoyable! Thanks for arranging such a professional experience. We had a fantastic time on this tour. Our driver, Chakib, picked us up from our hotel promptly and was so friendly. On the way to the mountains we stopped at a pottery shop, had mint tea in a Berber family's home, and saw where they make argon oil in the village. Once at the mountains, we were led by a guide who carried our bags most of the way on our hike to see the beautiful waterfalls. The only down-side to the tour was the lunch. The restaurants obviously take advantage of the tourists being there and we were charged silly money for really poor food. So I would recommend having lunch back in Marrakech if you can. But apart from that, the whole day was brilliant and we were so pleased to see a different part of Morocco outside of Marrakech. 5 stars!